Meanderings and Reflections: Throw in a couple of stars, will you! Are soothed beneath the artist's loving hand.' simply lovely!!! Beautiful post combining my favorite lyrics in a song with a very beautiful painting, with so much gentle melancholy in both. I follow your sentiments completely, and love the connection you make. Stars and van Gogh are a deadly combo! The song does evoke many stirrings within us. I am glad you enjoyed the painting and the song. Your visits always leave me with happy happy feelings. Susan, I absolutely loved this post. I love the "impressionist" era and Monet is one of my favorites but I also am intrigued by Van Gogh. Additionally, I don't think I ever really listed to the lyrics of "Starry, Starry Night". I thank you for printing them here. Very stirring. I love Van Gogh... I have two of his works on tapestries I bought from Belgium. They are gorgeous... and transporting. And, I love McLean. And this song. It is an old one... a classic... but eternal. When we lived in Belgium, one town away from where we lived, there was a house that Van Gogh lived in when he was "in hiding" so to speak. I went to visit that house once, on a rare occasion when it was open for visits. And when I stepped inside, there was an indescribable presence of sadness. It was a truly haunting experience. And this post has brought it back to me. Such stirring memories! Thank you for a lovely post, dear Susan. Monet is one of my favourites as well. I am glad the lyrics stirred you. McLean has a very sober voice whose liquid tone melts within. Have a lovely weekend dear Nevine and warm hugs back to you. I love Van Gogh and this painting. When I see it, it transports me to ...a sad, mellow place within me. Like most masterpieces, it touches me on a level beyond the linear. What a nice post. Thank you Deborah. I love this painting as well. There's always something new to discover in it! 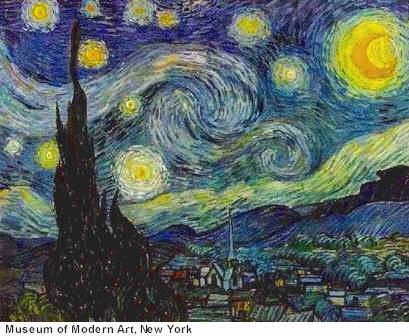 "Starry Night" is a seminal and beautiful painting. 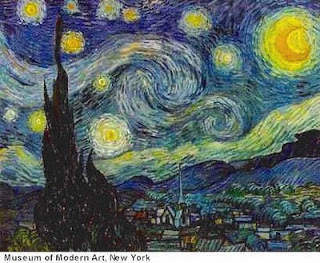 It is simple, like all great art...a simple depiction of the stars, but so much meaning, so much depth. Not to mention the texture of the piece - I am in awe whenever I see it. And yes, I agree...there is a sense of melancholy, as their is with most of Van Gogh's work, he lived, after all, such a melancholic life. All great art are simple yet captivating. I wonder whether the melancholy within him showed in his works. He is said to have loved this piece. Maybe the painting itself is happy but we turn melancholic when we see and experience it! 'Lust for life' was my first introduction to Vincent Van Gogh and his work. Thanks for sharing a tidbit about you. Your visits give me joy! Starry starry night is one of my favoritestest songs! Wow. The beauty in melancholy and sanity. I love gazing at the stars, Susan. :) Such poetic happiness, art gives us. It's truly wonderful. I think I have to stare/gaze at this picture for a long time to reflect what I feel...It'll take time. I love Van Gogh and that classic song/lyrics really spoke to my soul. Thanks for sharing this remarkable post, Susan. Hope you're having a relaxing weekend. I am happy that you stopped by inspite of your busyness. Honoured indeed. Your kind words always make me happy and joyous. Love that song, but are you trying to make me cry? I'm in the process of writing a post about the power of using emotions when giving a speech. This is a poweful example of how emotions are used in song lyrics - hope you don't mind if I make a reference to this post and that great song. Welcome here and please do use the contents of this post. I am honoured indeed. And, I did not try to make you cry. The song worked its way into you, I reckon!